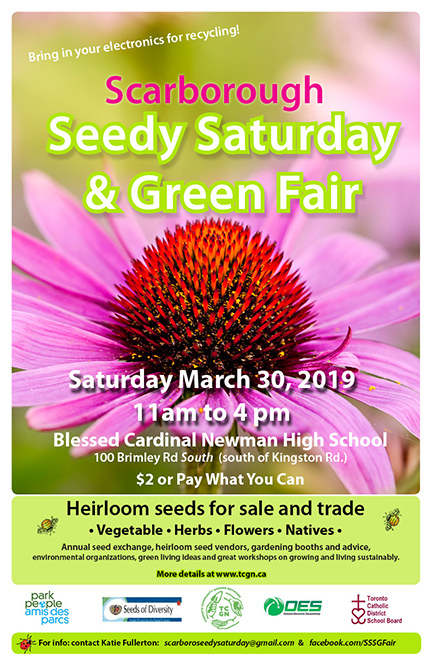 This year's Scarborough Seedy Saturday and Green Fair takes place at Blessed Cardinal Newman Catholic High School on Saturday, March 30. The popular Scarborough Seedy Saturday and Green Fair returns for its 10th year on March 30. This year’s event features more than 50 displays including the Seed Swap in which participants can bring their seeds to trade, organic and heirloom seed vendors, flower and garden associations, nature, park and eco booths. Also, Park People will be hosting their annual Scarborough Park Forum. A key part of the fair includes the gardening workshops. There are three this year – two of which are being headed by local residents. The first workshop at 1 p.m. is Grow Without A Garden hosted by author Lara Lucretia Mrosovsky, a resident of Birch Cliff. Mrosovsky just spent the past year writing her book Grow Without a Garden: 101 Plants for Containers. Just released, the book is a companion to her previous title An Illustrated Guide to Growing Food on your Balcony. Mrosovsky was inspired to write this book as a support for all those, especially apartment dwellers, who lack access to a garden and have a keen interest in growing. If you miss her presentation, she will have a table at the fair all day. At 2 p.m., Upper Beach resident Virginie Gysel from SPOTT gardens landscape design and Leila Mireskandari from Urban Guilds Permaculture will present Bringing Nature Home and Permaculture in your Backyard. The presentation will explain how to design and landscape your gardens so that they are beautiful, provide you with fruit and vegetables and most importantly support biodiversity. She calls it Ecoscaping and Foodscaping. Mireskandari and Gysel will both have a display at the fair. The final workshop at 3 p.m. will be of great interest to gardeners and Scarborough residents. The Toronto Region and Conservation Authority will present Beautiful Native Plants and The Meadoway in the Hydro Corridors. Those attending can learn about the inspiring beauty and practical benefits of gardening with native plants. You will leave with the know-how to create a natural oasis that will enhance your property and benefit local wildlife and pollinators! And you will also learn about the exciting plans for a pollinator friendly corridor on hydro lands (and how your native plant garden can support this.